Artist member Matina Marki Tillman will have prints on display in two national exhibitions during August and September. 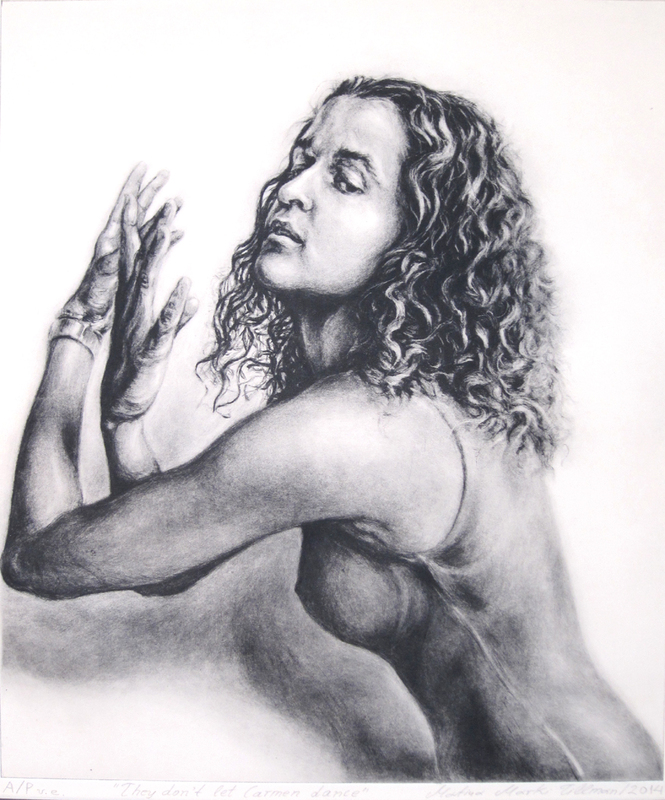 “They don’t let Carmen dance,” a solarplate etching that carries on the artist’s series of charcoal drawings on vellum directly etched onto solarplates, is currently on display in the Northwest Area Arts Council’s Real People 2014, a show dedicated to the human figure and portraiture (Aug. 7 through Sept. 28). This recent work is the artist’s homage to the uncompromised female, as portrayed in two of her lifelong inspirations, Bizet’s opera, Carmen, and Kakoyiannis’ film Stella. Also this fall, “Arabesque,” the first of this series of etchings, will be hosted in the Salmagundi Club gallery in New York City for the Hudson Valley Art Association’s 82nd National Juried Exhibition running from Sept. 20-26. “They don’t let Carmen dance” was also featured in the inaugural Washington Printmakers Gallery member’s exhibition at the new Georgetown gallery space in July. With the upcoming Hudson Valley show, prints from the “Arabesque” edition will be appearing in their sixth national exhibition in two years, including venues at the Customs House Museum in Clarksville, Tennessee; the Museum of Printing History in Houston, Texas; and the New York Society of Etchers national intaglio exhibition in New York’s National Arts Club gallery. This September, “Arabesque” will travel home to be included in the member’s show in WPG’s new gallery. From April 30-May 25, Washington Printmakers Gallery will present the work of member artist Marian Osher in her solo exhibit Jambo, Tanzania. The opening exhibition for this show will take place 1-4pm on Saturday, May 3. Below, you will find more information on Osher’s work and exhibit. Marian Osher and her husband Chuck realized a dream, when they went on a safari last summer to Tanzania, Africa. They learned that African wildlife has been threatened by poachers, cyberhunters and trophy hunters. Elephants and rhinoceros have been killed for their tusks. Fear of diseases carried by the tsetse fly has historically provided “justification” for reduction of the African wildlife population. Fifty colorful monotypes present an “alphabet” of Tanzanian wildlife – birds, baboons, cape buffalo, a cheetah, dikdiks, elephants, giraffes, grants gazelles, hartebeests, hippopotamuses, impalas, lions, leopards, a lizard, monkeys, ostriches, a rhinoceros, Thomson’s gazelles, wildebeests, warthogs, and zebras. Marian Osher with the etching press. Photo by: Julie Hipkins. Eighteen of the prints on the wall are mixed-media monotypes on canvas. 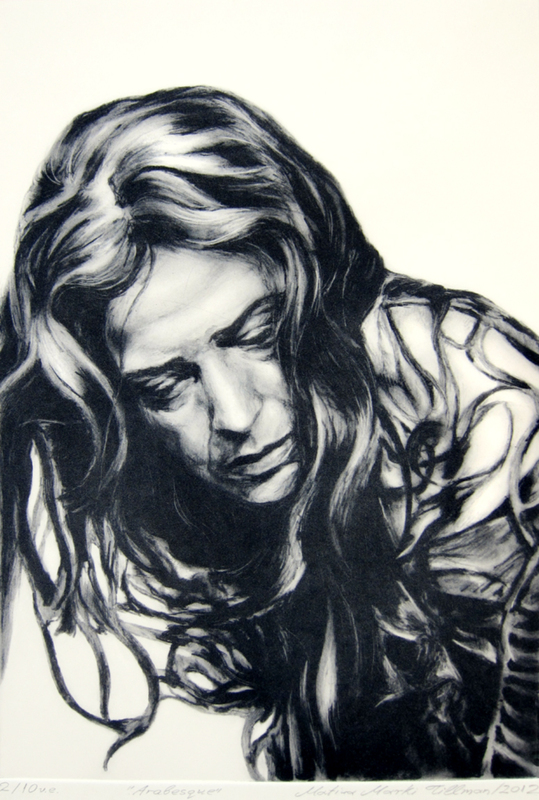 Creating the Monotype: Osher draws and paints her image on a mylar plate, using a combination of water-soluble media. Next, she transfers the image to dampened paper with her etching press. After the monotype is dried under weights over night, Osher tears off the white border around the print with a deckled edge ruler. Hand embossing: Osher decides which areas of the print she wants to emboss. First she uses a stylus to score the edges of shapes on the front side of the print. Then she turns the print over and uses a burnisher to hand emboss the shape that she want to raise. The Canvas and Assembly: Osher paints the canvas using a subtle combination of colors that complement the print and relate to the colors of the Tanzanian dirt roads. She cuts an acid free foam board to a size that will allow the deckled edge of the print to extend slightly over the foam board. The foam board is lightly filed, sealed with Golden GAC 100 medium and painted on the edge to match the color of the canvas. The print is sealed with an isolation coat of diluted Golden Soft Gel medium and is mounted with the same medium, undiluted, onto the foam board. The foam board is mounted on the canvas. The canvas and the print are then treated with three final varnishes to protect and preserve the artwork without glass. Viewers can also enjoy twenty monotypes, matted and framed in wood frames that complement the artwork. The framed monotypes are also selectively hand embossed, as are several matted prints in the bin. Osher expresses gratitude for the opportunity to witness glimpses of the daily life of wildlife in Tanzania. She feels that it was inspiring, and a special gift to see animals in their family and tribal groups in a natural setting. Creating the artwork for Jambo, Tanzania allows her to share the gift and insights that this experience brought to her. WPG member artist M. Alexander Gray currently is exhibiting his work at the Arlington Public Library. Gray, who studied printmaking at the Corcoran College of Art + Design, is showing woodcuts, relief engravings, and copper engravings that depict landscapes and historical sites. This exhibition will run at the Central Library through the month of April 2014. For more information, you may visit Gray’s artist page on WPG’s website, or visit the library’s overview page for the show.